A former scaffolder is building a new career in financial protection advice with a thriving Teesside firm. Darren Roulston left his job in scaffolding to take up a new role with Bespoke Financial Services, which recently expanded to new offices in Stockton. The 44-year-old, from Middlesbrough, had previously spent 20 years working as a sports development and education officer for a local authority before going into the building trade. And after completing his financial protection training last year, Roulston joined Bespoke’s growing team of advisors in December. “It is quite a career change but I’m well versed at diversification!” said Roulston. Bespoke Financial Services was launched by Lee Flannagan in November 2014 – he now oversees a team of 20 from the firm’s Boho Four base in Middlesbrough and new offices at Gloucester House Business Centre in Stockton. Roulston joins 38-year-old James Brass at Bespoke who also opted for a career change 18 months ago, joining Bespoke from the motor sales trade, and mortgage and protection advisor Nathan Steel. Steel, also from Middlesbrough, is one of Bespoke’s longest-serving advisors, having joined two years ago. The 24-year-old said: “We try to take a relaxed view and get to know our clients’ personal and financial situation, and recommend from there. Bespoke offers advice on mortgages, critical illness cover, life Insurance, income protection and insurance services. 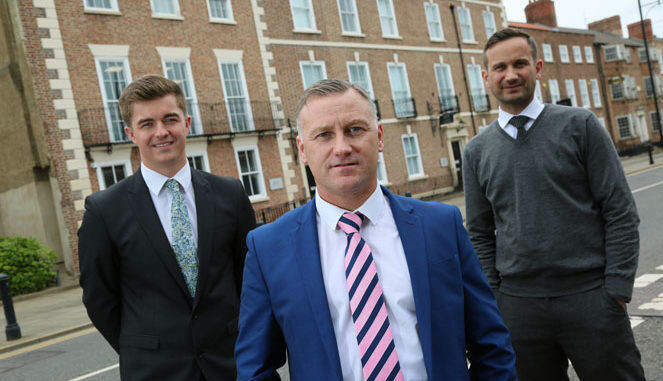 • Pictured (above): Bespoke Financial’s latest protection advisor Darren Roulston (centre) with Nathan Steel (left) and James Brass outside the firm’s new Stockton offices.